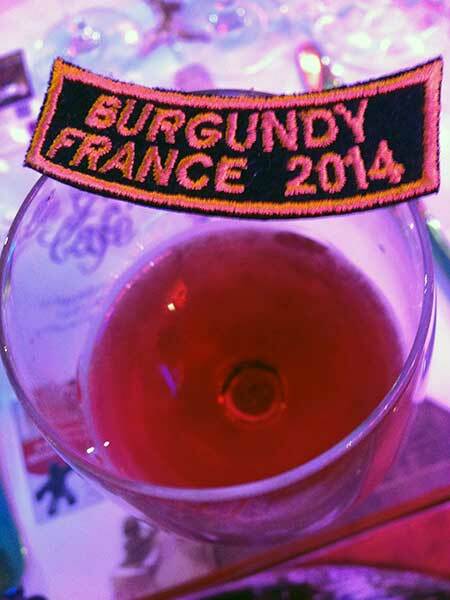 This trip was conceived as the 2013 Champagne Celebration ride was still in full swing and so participants had a long wait! Six days and five nights, would we all get along? Burgundy is just shy of 400 miles from Calais which of course doesn’t include the journey distance/time from the London area, base for most C&F members. I say most as Justin Webster had a ‘huge’ journey of one junction before the Eurotunnel terminal! So, with the journey from London, tunnel waiting, crossing time and the ‘one hour forward’ that France works on we decided to start with an easy day ride to position ourselves in France, Arras to be precise. Two groups formed for this leg to get to the official meeting point with Steve, Fred, Justin and Peter (Jane, pillion) going out in the morning followed by the afternoon party of Moi, Jane, David (Angela) and Les (last man). However, the afternoon party ignored that memo and decided to arrive before the morning group so we all ended up on the same outbound train. Into France and we split up, Steve led his group along the coastal road towards Boulogne whilst the PM group headed inland via some quite splendid local roads before stopping for lunch in the small town of Desvres (pop 5200). 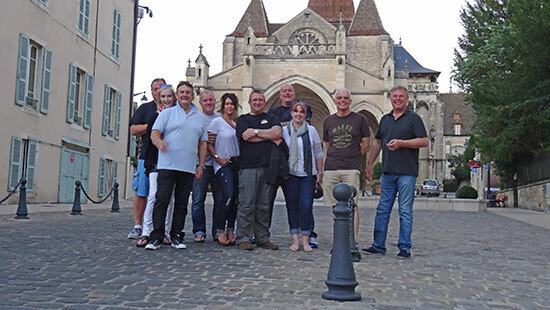 In the town square we found a restaurant that was packed but just about had room for the five of us - following lunch we headed on for Arras arriving via the N39. L’Assiette au Boeuf in the Grand Place was the chosen restaurant where we all ate outside next to a fair - most had steak n chips with unlimited fries which was pretty good and perhaps washed down with a little red wine. Nine AM we departed for Beaune in the Burgundy region with 200 miles to be knocked out in quick order via the auto-route leaving us around 120 miles on the N71 from Bar-sur-Seine. Of course not everyone had read the memo about arriving with a full tank for a swift departure, we’ll mention no names Peter! We’d not long started out when Fred pulled over, later he’d try and blame it on an intermittent electrical fault but we knew he’d left his chin strap undone. The N71 was a pretty good main route with lots of bendy bits to enjoy, a coffee stop later we eventually arrived in Dijon. We were delayed slightly as at a set of lights in Dijon, with a certain Mr Graham alongside me I say we are heading for the Beaune green primary route signs which meant changing lane, the lights change and all of a sudden Mr G has nipped in front of me and has turned the group onto the wrong road, typical, the only point we make a wrong turn is when the ride leader has changed!!! After the group realised the ride leader wasn’t even capable of getting his afternoon ride to start at the correct time of day, I knew I would need to take over quickly. The opportunity presented itself as we headed through Dijon. Traffic lights gave me the opportunity to pounce and as the lights went green I was away. I heard the rants of the now deposed Nick Deal (C&F Safety Officer), but I cared not I had freed the group from his tyranny. We headed south for around 100 metres and then a certain tyrant made his feelings known and moved back to the front of the group. It was a short lived ride but everybody enjoyed the road and the wonderful weather I managed to arrange. We arrived, dropped our gear and a little later headed into town. Now Beaune isn’t a big town really so the walk was fairly short, we found food, we ate, we drank, we were happy, especially after ribbing Mr G a bit for the error of his ways. Friday AM and we mounted up and headed out into wine country following a trail of small but beautiful roads through some of the worlds most expensive vineyards. At the coffee stop C&F’ers said they enjoyed the ride so far then the café owner dialled up the local Dijon H.O.G. chapter on her computer. 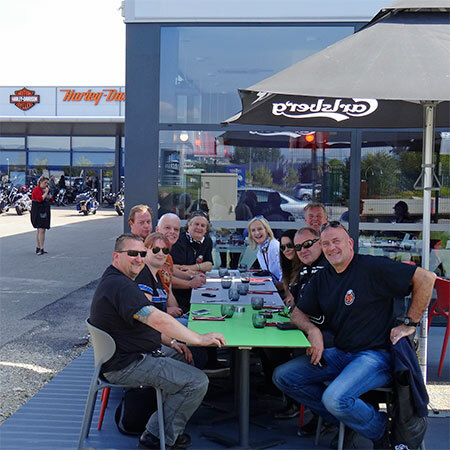 In fact the local H-D dealer in Dijon was where we were headed to next, however on arrival they were just closing for a two hour lunch - there was a restaurant next door and Fred advised that a two hour lunch could be enjoyed, it was and we all pretended to be French or Italian (apart from Fred). Jane Mann (Peters ‘other half’) wanted an air seat pad but the dealer didn’t have one in stock so over the next few days we constantly heard her say words to the effect of ‘I have a sore bottom’. Never mind, I’d got an H-D Dijon t-shirt for the collection so at least I was happy. It was hot, very hot and the group decided that was enough for the day in terms of riding apart from the journey back to Beaune. We might then have enjoyed a few beers before heading out for a great evening meal. This was the first location where we heard Les ask if they had garlic bread and we might have heard it a few times more! Saturday arrived and this was planned as a non-riding day, in the morning we walked around the local market, we stopped and had a few beers. Collectively we decided to buy lunch from the market and have a picnic back at the hotel with a few bottles of burgundy. A couple of roast chickens, some ribs, cheese, ham hock and bread, it all went down a treat. 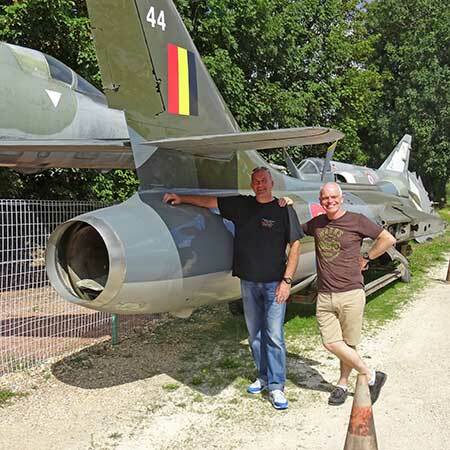 We ordered a mini bus for the 4km journey to the next town where we visited a magnificent chateaux which housed a huge collection of fighter jets, 250 pre 1960s motorcycle, 30 Abarth racing cars and more. It was hot, very hot and after walking around for an hour or so we were mostly knackered (can’t think why) and we’d collapsed in the shade at a few tables. Steve Graham materialises with about 15 bottles of water and the wrapper of a magnum ice cream, ‘bought this lot in the village for 6 euros’ he says - I think some even kissed him. We called the taxi firm they sent the same mini bus to collect us, Les sat in the front again but you’ll have to ask him why. 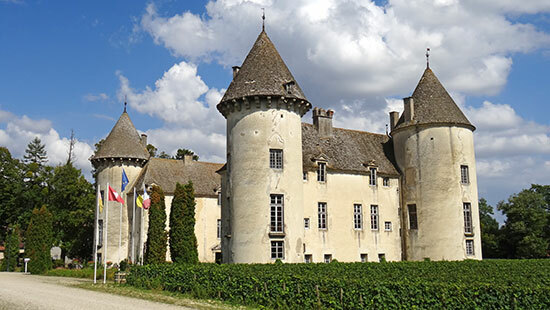 Justin hadn’t come with the group to the chateaux feigning some pain from a recent operation - in fact he managed a five and a half hour afternoon kip - good effort. Anyway eventually our by now happy little gang headed off for dinner outside Le Grand Café before fading fairly early for bed. With a 10am start time bargained for the night before members had a bit of a lay in and everybody looked good in the morning including ‘Don Johnson’ (Justin) which was Jane Mann’s new nickname for him. We departed on time heading in the direction of Soissons before turning onto the D6 a great road through the French countryside which was very much enjoyed. After a coffee stop, and a fuel stop we jumped on the A1 heading back towards Calais determined to arrive on time. On route we stopped at possibly the worst service station in France, in fact we thought we were back in England already! By 4pm we had arrived in Calais prompt and hoped for an early crossing only for our hopes to be dashed by a train that had gone ‘tech’ (no air-con) which caused a short delay. No one seemed too bothered as the weather was still warm, the sun was out and we’d managed six days in France with everybody still talking to each other and NO RAIN! Following our extended lunch in Dijon as described above we never got around to riding the D33 and D970 which are fabulous quiet country roads to the west of Dijon and Beaune. If you are passing it’s worth a detour.